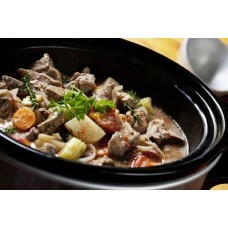 Lamb casserole with black pudding | Bonners of Ilminster "
Heat 1 tbsp oil with the butter in an oven casserole until hot. Toss the lamb in a large bag of seasoned flour then tip half into the fat and brown all over. Remove with a slotted spoon then brown the remaining meat and remove. Add another 1 tbsp oil and gently fry the onion, leek and garlic until softened then return the meat to the casserole with the rosemary, wine and stock. Bring to the boil then cover and remove to a preheated oven ( 160C / 325F / Gas 3) for about 1 hour, stirring once. Remove from the oven, discard the rosemary. Increase the heat to 190C / 375F / Gas 5. Place the black pudding slices on top, overlapping slightly. Brush the slices with a little olive oil and replace in the oven for about 25 minutes until the stew is bubbling and the top crusty. Serve at once with mashed potatoes and a green vegetable. I absolutely adore black pudding and so this combination â a tasty lamb stew topped with black pudding that is soft underneath and crusty on top â is my idea of heaven. A good bottle of red wine will make it more divine!